Follow along as a developer teaches himself to code in C by implementing networking protocols and OpenSSL. As part of my usual routine, I’m trying out writing some code in C, to get a feeling for a different environment. I wanted to build something that is both small enough to complete in a reasonable amount of time and complex enough that it would allow me to really explore how to use things. I decided to use C (not C++) because it is both familiar and drastically different from what I usually do. The project in question? Implementing the network protocol I wrote about here. Another part of the challenge that I set out for myself was to make this code as production quality as I could, which means paying all the usual taxes you would expect. The first thing that I had to do was to figure out how to actually perform networking and work with SLL in C. Something that would take me 5 minutes in C# took me a several hours of exploring and figuring things out. Eventually, I settled down on the obvious choice for SSL with OpenSSL. It is portable, reasonably well documented, and seems fairly easy to get started with. This is interesting. It shows what needs to be done and does it quite clearly. Unfortunately, this isn’t production quality code, there's a lot of stuff here that can go wrong that we need to handle. Let’s wrap things in proper functions. The first thing to do is to capture the state of the connection (both its socket and the SSL context associated with it). I created a simple structure to hold that, and here is how I close it. As you can see, quite a lot of this function is error handling and cleanup. This code looks like it does the right thing and cleans up after itself in all cases. So far, so good, but we are still missing a very important component. We handled the error, but we haven’t reported it. In other words, from the outside, any failure will look exactly the same to the caller. That is not a good thing if you want to create software that is expressive and will tell you what is wrong so you can fix it. If this was C#, I would be throwing an exception with the right message. As this is C, we run into some interesting issues. As part of your error handling, you might run into an error after all. In particular, good error handling usually requires string formatting, and that can cause issues (for example, being unable to allocate memory). There is also the issue of who frees the memory allocated for errors, of course. Typically, you’ll see code that either prints to the console or to a log file and it is usually a major PITA. 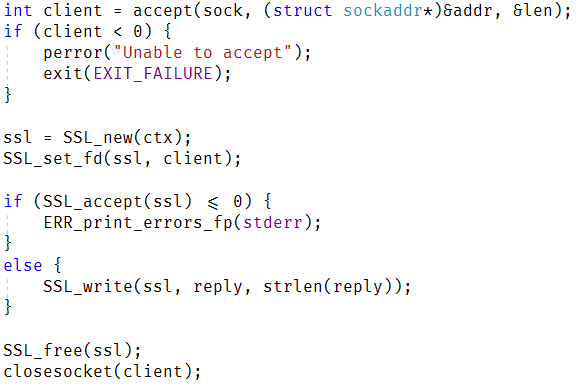 OpenSSL uses a thread local error queue for this purpose, which gives you the ability to hold a context, but it requires an awful lot of ceremony to use and doesn’t seem to be useful for generic error handling. I decided to see if I can do a quick and dirty approach to solve the same problem, with something that is slightly more generic. The purpose was to get a reasonable error handling strategy without too much hassle. Here is what I came up with. This is a bit much, but I’ll explain it all in a bit. And yay, I created exceptions!